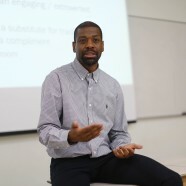 Marvin is an associate professor in the Alberta School of Business, and serves on the faculty of Physical Education and Recreation as an adjunct professor. He is also in demand as a speaker, where his goal is to inspire people about the possibilities that conscious leadership and strategic change can create. Recent engagements have included serving as the a key note speaker for the Edmonton Police Service, Alberta Professional Engineers and Geologists Association, Alberta Annual Leadership Conference, Stantec Marketing Managers’ Annual Meeting, American Society of Quality’s Annual convention, the annual meeting for Alberta Infrastructure, the Edmonton Chapter of the American Society of Quality, and the annual quality manager’s meeting for Enbridge. Marvin has published more than 40 articles, made more than 40 conference presentations, and is the author of two books on leadership and organizational change: Pack Leadership: Lessons from the Wild Dogs of Africa (with Stephen Hacker at Quality Press), and Successful Organizational Transformation: The Five Critical Elements (with Stephen Hacker and Marla Hacker at Business Expert Press). He is the academic director for the Alberta Health Services Senior Leadership Development Program, and has a long-standing engagement with Anahuac University in Mexico, where he is a part of its CEO academy. Prior to life in academia, Marvin was an operation’s manager for Procter and Gamble. Marvin has a Ph.D. in Organization Behavior and Sociology from Northwestern University, the Kellogg Graduate School of Management; and a B.S. in Industrial Engineering from Northwestern University. Marvin is a partner with Transformation Systems International (TSI). TSI believes that successful organizational change starts with having a holistic approach to changing individuals by awakening them to understand their full and unlimited potential within the organization and also the world around them. To have engaged people fully “awake” and “conscious” is a vital ingredient for transformational change within teams and organizations. TSI offers a number of pre-designed workshops or is happy to work closely with organizations to design a curriculum that is relevant to its specific challenges. It also has a number of team members available for consulting or speaking engagements. Learn more about TSI and contact it today to discuss your change initiatives.